Some surgical procedures used in periodontics are aimed at regeneration of lost tissue and bone. Regeneration has been successfully done in other disciplines besides dentistry. Examples include injecting chondrocytes in to the joint space of arthritic knee joints instead of replacing the knee with a prosthesis, or using stem cells to replace pancreas cells that have stopped secreting insulin for patients with diabetes. These types of procedures and surgical techniques are known as regenerative medicine. In periodontics, bone and soft tissue can be regenerated using these techniques to a limited degree, usually around one or two teeth. 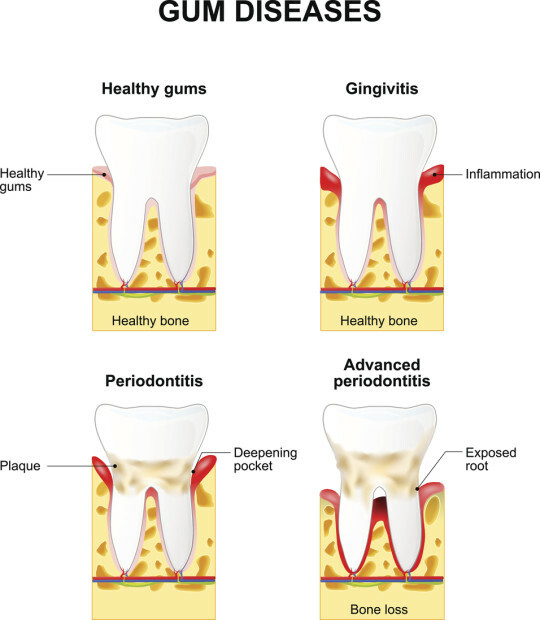 In an ideal world, the periodontist would be able to treat all the areas of the mouth of someone who has periodontitis using regenerative techniques and these areas affected by periodontal bone and soft tissue loss would return to normal levels. If that could be achieved, then a ‘cure’ would have taken place. But, the type of periodontal bone loss most conducive to regeneration tend to be the confined bone loss lesions. We call these types of bone loss defects ‘vertical’. The aggressive loss of bone results in a space between the bone and the teeth, that is able to be filled with bone graft or other regenerative materials and biological products and then covered with a collagen or soft tissue membrane. Under such conditions, regeneration can occur. Vertical bone loss however is less common and found usually in younger patients that have a more rare form of periodontitis called Aggressive Periodontitis. The most common bone loss pattern seen in adults with periodontitis is the type that occurs more slowly and over a longer time period. This ‘horizontal’ type of bone loss is the most common, and is not amenable to regeneration. Efforts to date to achieve regeneration of horizontal bone loss has only been demonstrated in animal models under ideal conditions. For example a landmark study published in the Journal of Periodontology in 1996 by Dr. Wikesjo and colleagues demonstrated in beagle dogs that horizontal bone loss could be completely regenerated using a strong growth factor called bone morphogenetic protein in a collagen based carrier material. In fact the study was so successful that the investigator were concerned that too much bone was grown. Subsequently, bone morphogenetic protein was eventually approved for use in humans, first in the field of spinal surgery, then for dentistry. But efforts to date to replicate in humans the animal studies that completely regenerated lost periodontal bone have not been successful.